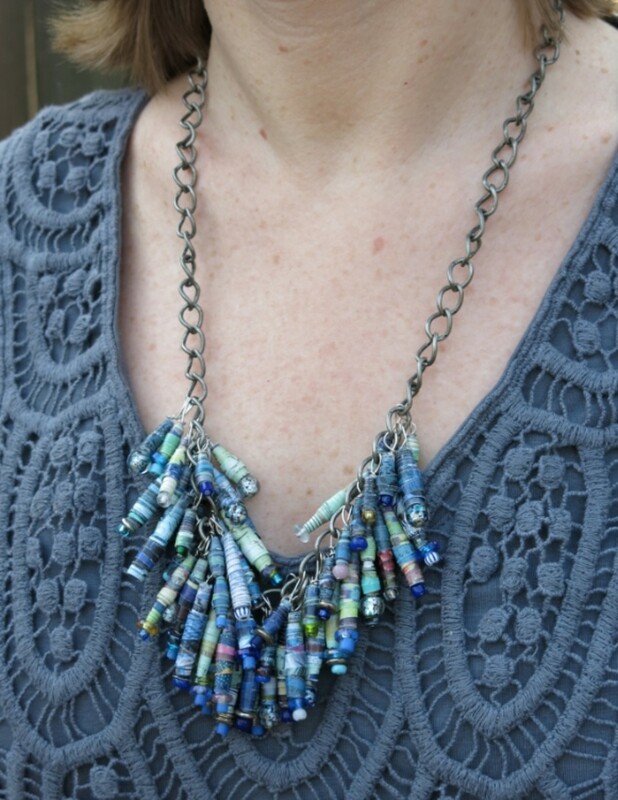 Your friends will never guess that this fun and colorful necklace is handmade with paper beads, created from recycled mail, maps, and magazines. 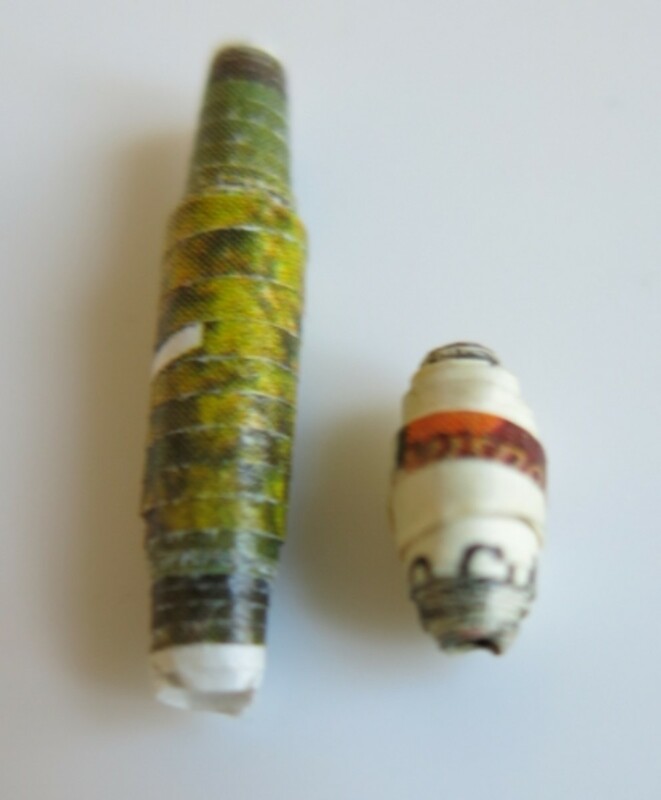 There are many ways to make paper beads. I used the method I learned at camp long ago to create a dangling beaded fringe for this stylish bib necklace. 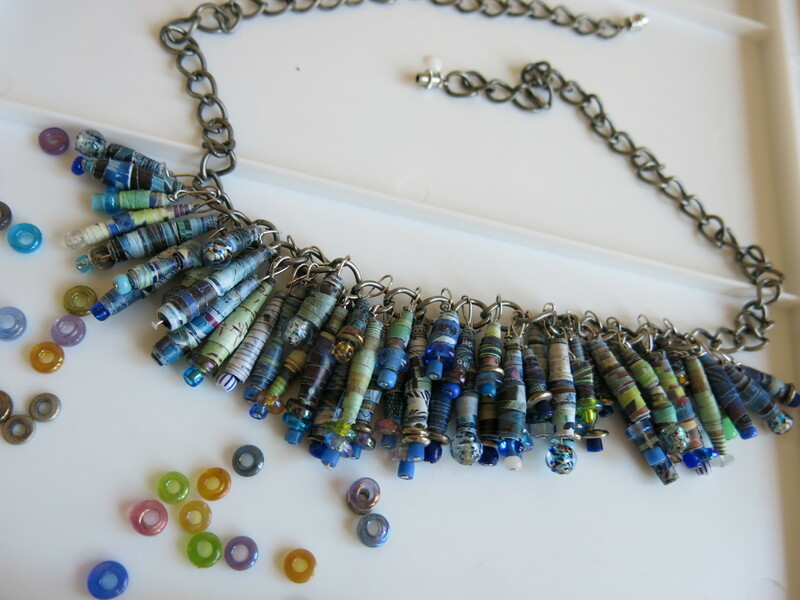 Old magazines, catalogs, and maps are handy sources and great materials for paper beads, and add rich color to this bib necklace project! The materials for making paper beads are pretty basic - you probably already have on hand! 6 to 10 full page images from magazines and catalogs (or you can use old maps!) 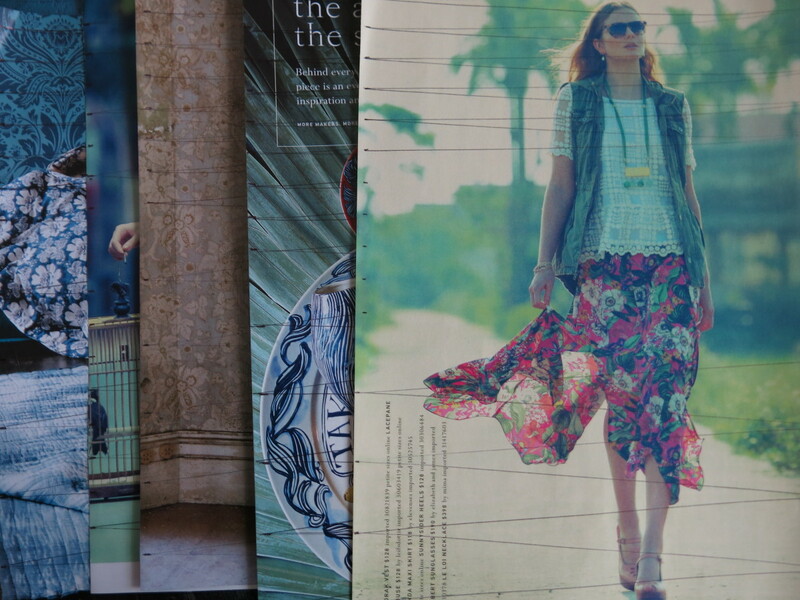 - clothes catalogs and fashion, design, or travel magazines are all great sources of images. 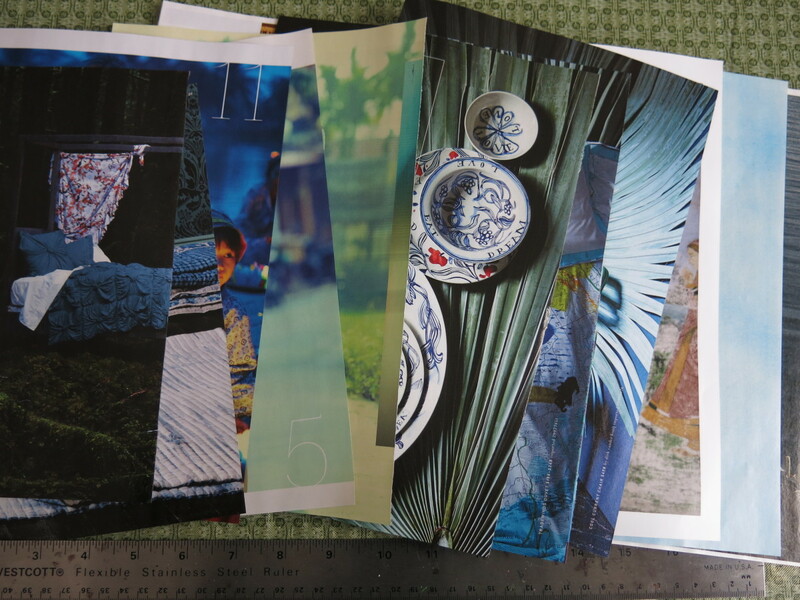 They usually have full page photos or illustrations with rich color, and are printed on thicker paper. You can usually make at least 20 beads from an 8 1/2 x 11 inch photo or image. smaller purchased beads - these beads can be all one color and style to pull your design together, or different colors, styles, and sizes to add more variety and texture. package of head pins - head pins can come in a variety of lengths. I always buy the longest I can find (about 3 inches). You can always cut them shorter with wire cutters if needed. a necklace chain with open links and a fastener - you will be attaching your beaded fringe through the links of the chain. You can either buy a length of chain or use an old necklace. I used a necklace with large links that I could attach multiple dangling beads from, but you can use a smaller link necklace too. 1. First, choose about six to ten images to use for your beads. I wanted my necklace to have an overall blue design, so I chose images with blue in them. However, it is impossible to guess what color each bead is going to be when finished unless you use paper that is just a solid color. I would recommend using images with colors that you like, make A LOT of beads, then choose the beads for your necklace from your collection of finished beads. 2. Working with one image at a time, measure and mark up the right hand side of your picture at inch intervals (1 inch, 2 inches, 3 inches, etc.). Start at the bottom of your image and work toward the top. See diagram for reference. You can mark and cut your image across either length-wise or width-wise. Longer triangle pieces will create wider beads. 3. On the left hand side of your image, working bottom to top, make your first mark at 1/2 inch. Then mark the rest of the sheet at 1 inch intervals (1 1/2 inch, 2 1/2 inches, 3 1/2 inches, and so forth). 4. Using a ruler, draw lines connecting the markings on the left hand side to the markings on the right hand side. You should create a series of pennant-shaped triangles. 5. Use scissors or a paper cutter to cut out your triangle shapes. Throw away the top and bottom paper pieces that are not evenly sized. 6. Continue marking and cutting your paper pieces on all your images. 7. Working with one piece at a time, take your triangle paper piece and place it face down on some scrap paper. Roll your glue stick over the last 3 inches of your pennant piece's pointy end. 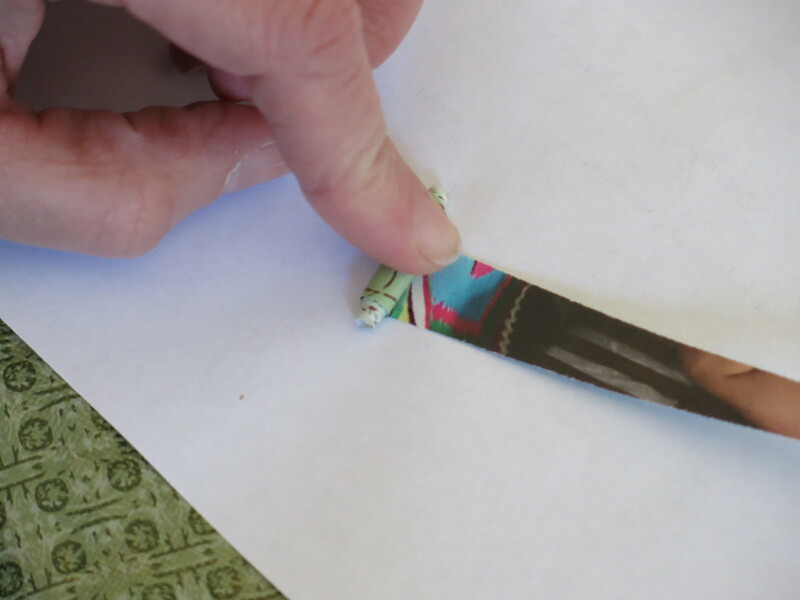 As you glue your beads and your scrap paper gets sticky, replace it with a fresh sheet. 8. Then starting at the wider end of your triangle, slowly roll your paper as tight as possible. It may be a little difficult when you first start rolling your beads, but you want to make the hole down the center as small as possible. Try to keep the ends of your bead even so that the point will roll up to the center of your bead. 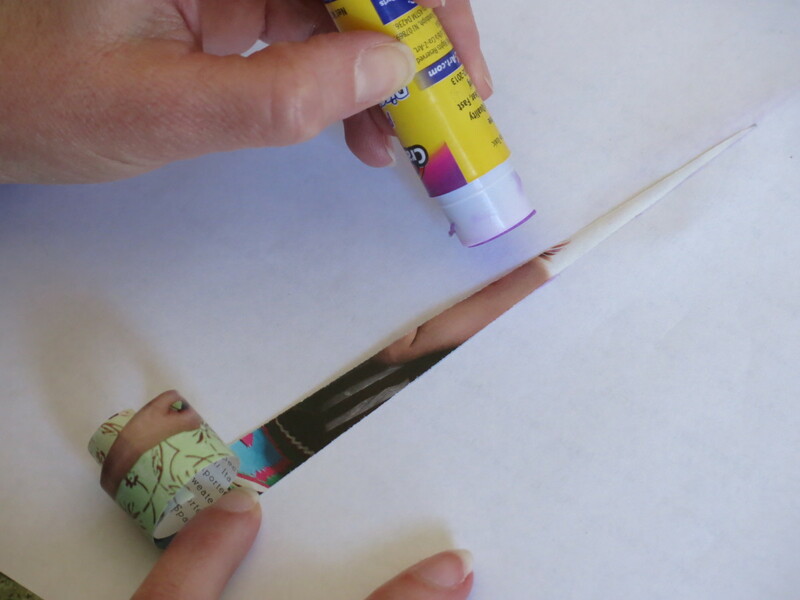 It may be helpful you roll your paper around a pencil before you put any glue on it just to get it to start curling. If you are making beads with small children, you can use an unfolded paper clip as a tool for them to roll the paper around to form the bead. 9. A perfectly formed bead will have the center point roll into the exact middle in the length of the bead. This will created an evenly rounded side on your bead. However, if your beads comes out uneven, they are still beautiful and interesting! As you roll your beads, you should notice how the colors in your images are displayed on your finished beads. 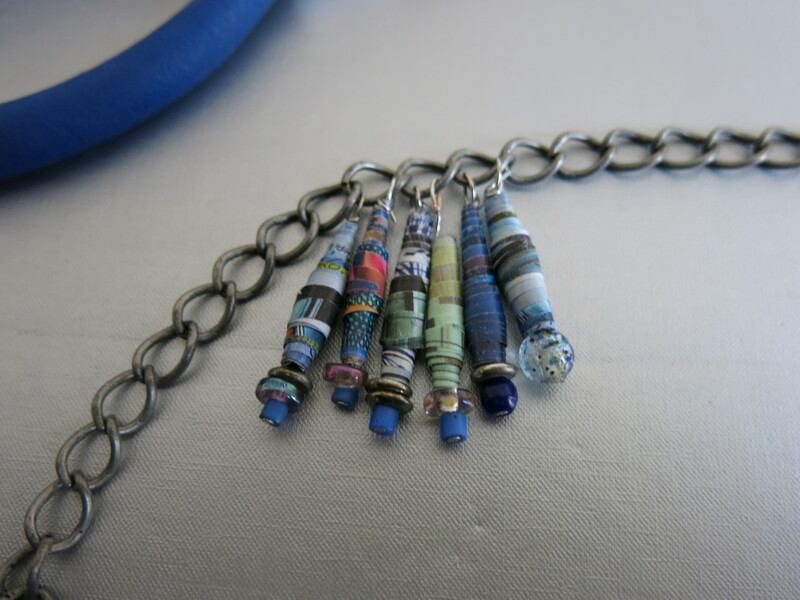 To make the most of the designs in my images, I marked my photos for inch-long beads at the bottom and half-inch beads at the top of each page. This left some unmarked paper in the middle that I threw away. 10. Some people use acrylic spray finish or acrylic liquid varnish to seal, harden, and protect their paper beads. I think this can be messy and is unnecessary. I have jewelry that I made from paper beads years ago, and the beads still have held together and look fine. Just be sure that your pointy ends have glued down firmly and completely. 1. 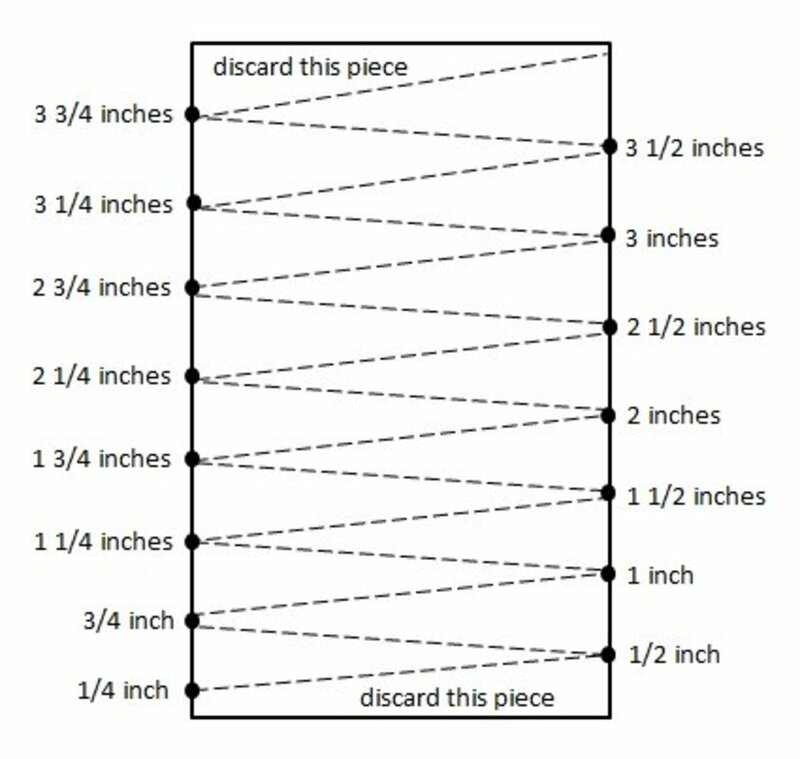 To make shorter and rounder beads, follow the instruction above however mark the right hand side of your image at 1/2 inch intervals (1/2 inch, 1 inch, 1 1/2 inches, 2 inches, etc.). 2. On the left hand side, make your first mark on the bottom at 1/4 of an inch. Then make the next markings every 1/2 inch (start at 3/4 inch, then 1 1/4 inches, 1 3/4 inches, 2 1/4 inches, etc.). Follow the illustration for marking and cutting your smaller beads. Continue to follow the directions above for cutting, rolling, and gluing your beads. I chose to make about 40 longer beaded fringe pieces and about 20 shorter pieces for my necklace. 1. 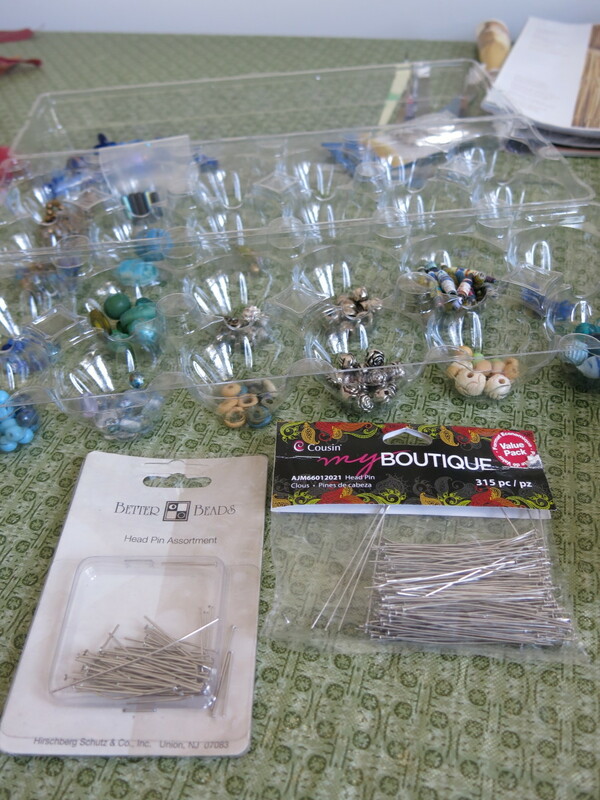 Take a head pin and place a small purchased bead on the bottom. 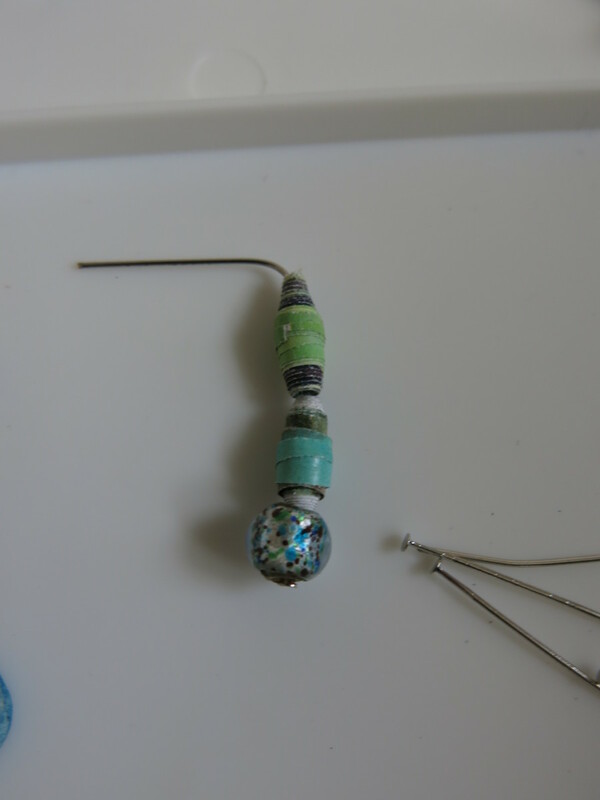 The hole in your paper bead will probably be larger than the end of the head pin, so you need this smaller bead to keep it from sliding off. 2. Choose beads that compliment each other to create each beaded fringe piece. 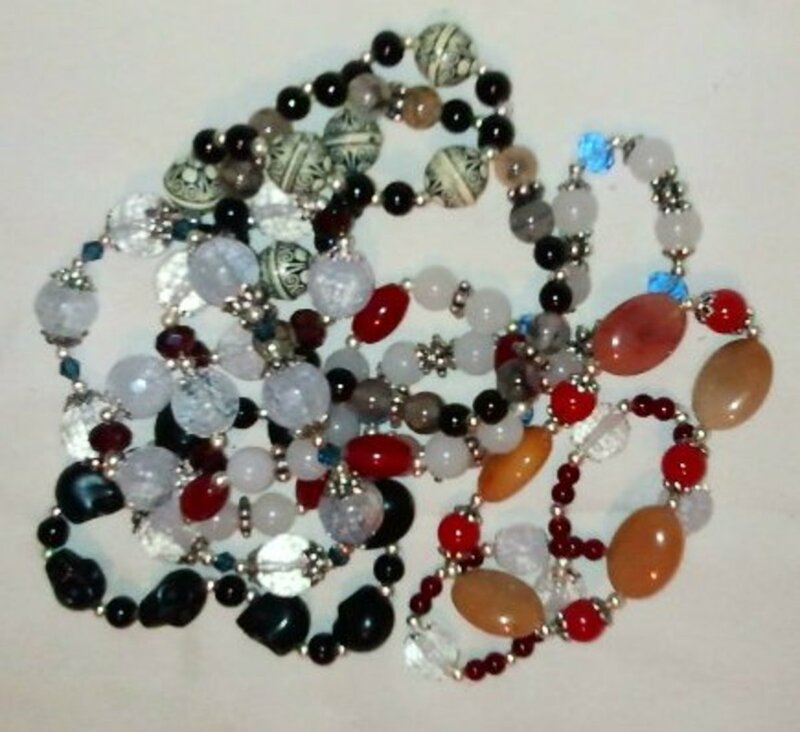 Again, you can use all the same purchased beads to create a more uniform color theme for your necklace, or you can mix it up to add more interest. I chose mainly blue and green beads to make my fringe. 3. You can layer your purchased beads with your paper beads, or use two smaller paper beads together to make a longer fringe piece. 4. Be sure to leave at least 1/2 inch of length on your head pin to make a loop attachment for your necklace. 5. Once I was finished with each piece, I put a slight bend in the wire to keep my beads in place and to stop them from rolling off. 6. As you make your fringe pieces, separate the longer ones from the shorter ones. 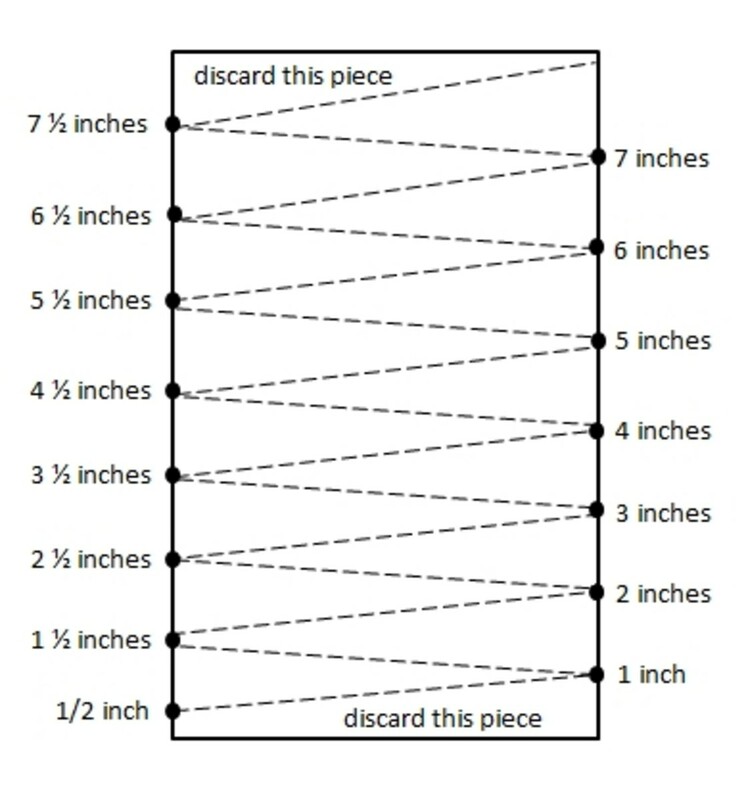 It might be helpful to line them up by length for when you are putting your necklace together. 1. If your length of chain does not have a clasp, attach your fastener before connecting your beads. 2. 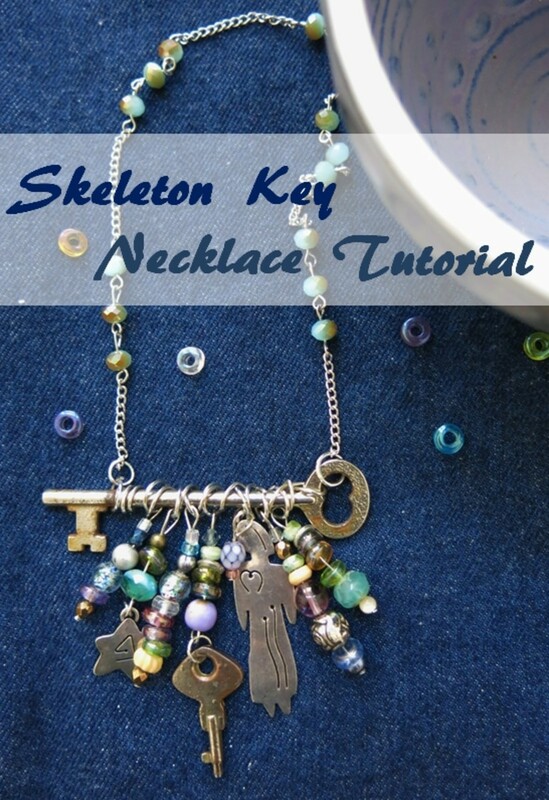 Then lay out your chain, count the links, and find the center point of your necklace. 3. Taking the longest beaded fringe piece (or two longest pieces), hook it through center link of your necklace. My necklace links were large enough to place two fringe pieces in each link, but you can also just put one in each link. I always connected my fringe to the bottom side of each chain link, so they all hung in an even line. 4. Use your needle nose pliers to make a loop with the end of your fringe piece's wire, and twist it around itself to connect it to your necklace chain. This might be tricky, but after attaching a few pieces, it gets easier. The head pin wires are quite malleable and I found it easier to twist the wire with my fingers. I then used my pliers to cut any excess wire and squeeze the ends in place. 5. Continue to attach your beaded fringe to your chain, working both sides out from the center point. 6. I added two shorter fringe pieces to each end of my line of long fringe to give the edge a rounded curve. 7. Then I connected one shorter piece of fringe to the top edge of each of my chain links. This created a double row of fringe on my necklace. I'm not sure all this detailed placement really mattered in the end. When I wear the necklace, the fringe hangs where it wants to hang, and moves with me as I move. But I think that's part of the design of this necklace. These paper beads are extremely lightweight and fun to wear! Copyright © 2014 by Donna Herron. All rights reserved. How To Price Your Beaded Jewelry - How Much Is It Really Worth? Hi Olivia - What a great idea and a wonderful gift! Thanks so much for sharing your suggestion. I hope your niece loves the necklace! Hi Dolores! Actually, these beads are so easy to make. You should definitely try to make some. You'll be amazed at how lovely your beads will come out :) Hope you give it a try. Thanks for stopping by and commenting! A nicely written article from a newbie in Hubpages. Thanks for details and photographs. I am a gem dealer and manufactured lots of emerald and ruby beads but never thought of painting beads. Keep it up! Oh new idea. I liked this eco friendly one. I recommend this as a jeweler. Rated up and beautiful. Hi Glimmer Twin Fan - Thanks so much for your sweet comments! I think the secret to making successful paper beads is to use slightly thicker paper (from fashion, travel or design magazines) or from catalogs, and then use glue stick , not liquid glue. Glue stick is easier to control and your beads won't get soggy. Good luck! I'm sure you and your daughter will have a lot of fun making these beads! Thanks so much for your comments, pin, and share!! This is gorgeous! I tried making these beads with my daughter a few years ago, but they did not turn out. I think I used too much glue or something. I'm going to have to try them again. Well done and a beautiful hub and project! Shared around. Thanks, Joelle! 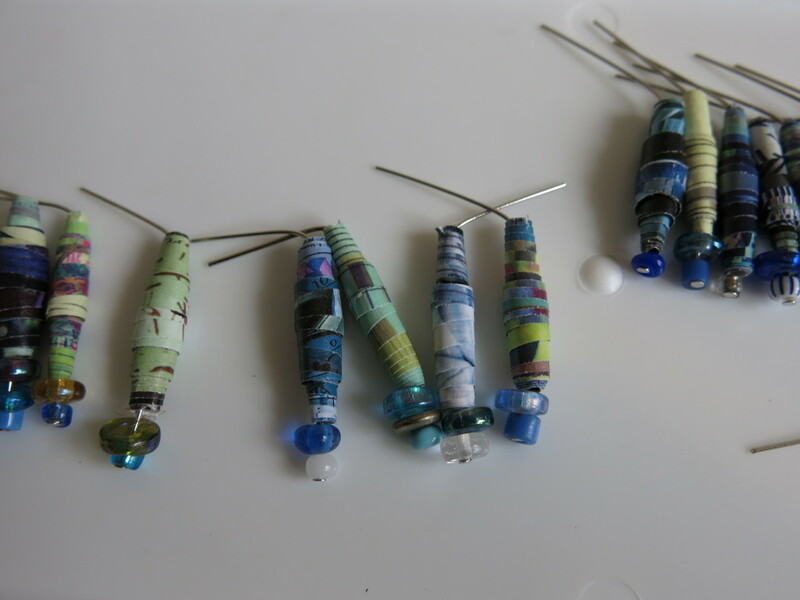 Yes, one of the great things about paper beads is you can use or mix them with other materials and make all sorts of projects. And that all age groups can make paper beads and enjoy creating with them. Thanks again for your comments and support! I appreciate it :) Have a great weekend!! Great necklace, Donna! I love the colours that you chose it looks simply stunning! I also like this type of "beads" because it's quite accessible to make with kids (less sophisticated version than yours) and it's reasonable in price. What I love with your work is that you can start with a simple concept and make it glamorous! Definitely voted up, useful, interesting, beautiful and awesome! I love paper beads, what a great way to use them. Pinning this one! Hi Suzanne - Thanks!! I put the beads in bunches because I wanted to create a more of an impact with the colors and different materials. I'm a little embarrassed (but proud) to admit that I've worn this necklace every day since I made it :) It's so fun and easy to wear! Thanks for all your kind words and vote up. I appreciate it! I adore this necklace! I've made the paper beads before into a single strand Indian necklace, but haven't seen it done like this in bunches. Looks like a very unique necklace to wear down the street, so I'll be trying it out and thank you for the pattern! Voted awesome and up. Hi Heidi - Glad to hear you like statement jewelry as much as I do :) I'm happy you like this necklace and appreciate your support. To ensure this necklace makes a bold statement, I suggest that you use photos or images with lots of different, rich colors and that you attach a lot of beads to your chain. I really like how wide the band of fringe is on my necklace and I'm glad I used two rows of beads to make my beaded section really full. Thanks so much for your comments, vote up, and share! Have a great day!! Thanks, Deborah! I appreciate you stopping by and commenting!! Beautiful! I love wearing statement pieces. Making my own would be a real statement! Thanks for sharing this gorgeous project. Voted up, beautiful and shared! 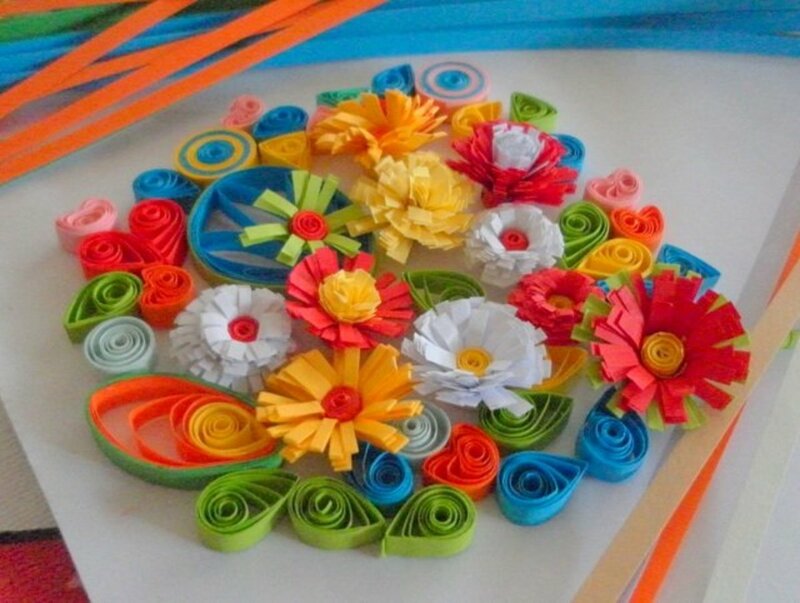 This is a terrific craft idea! Voted up +++ and pinning! Hi Phyllis - Thanks for your comments, share, vote up, and support! I'm glad to have introduced you to a new bead making technique. Paper beads are fun to make and it's always a surprise to see the finished bead that results from each photo. These beads are very lightweight and can be used in a number of projects. I hope you enjoy making some of your own :) Thanks again!! I have never heard of this technique before and never would have guessed one could make beads from paper. This is an awesome and well-written hub with excellent insrtuctions that are easy to follow. 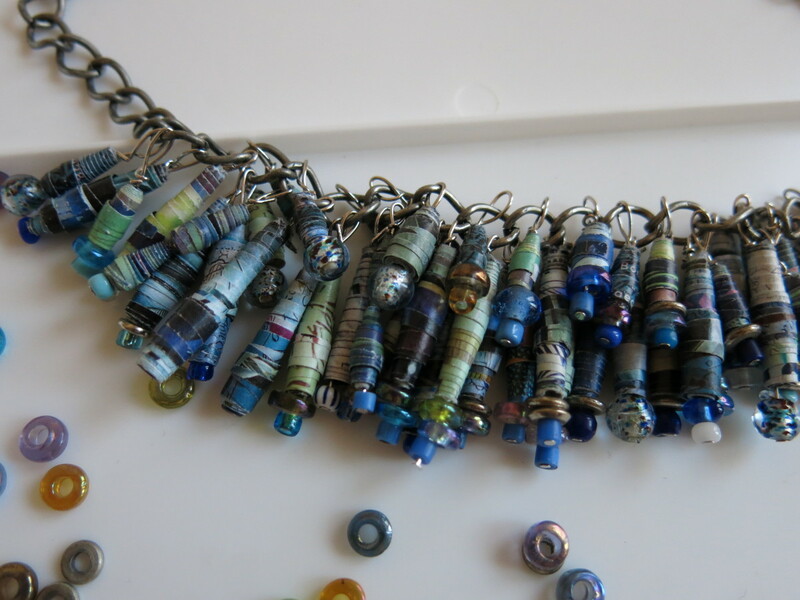 I am really impressed and anxious to make some paper beads and a necklace like this. Thank you so much. Bookmarking and sharing. Voted up, and across. Thanks to all of you for your kind comments and support! I appreciate it!! @Heather Says - Thanks so much!! @theframjak - BTW, this might be a project the whole family can enjoy, but this necklace is ALL MINE to wear and enjoy :) Thanks again!! @RTalloni - Thanks so much for the pin! Such a fun piece this would be to make and wear. 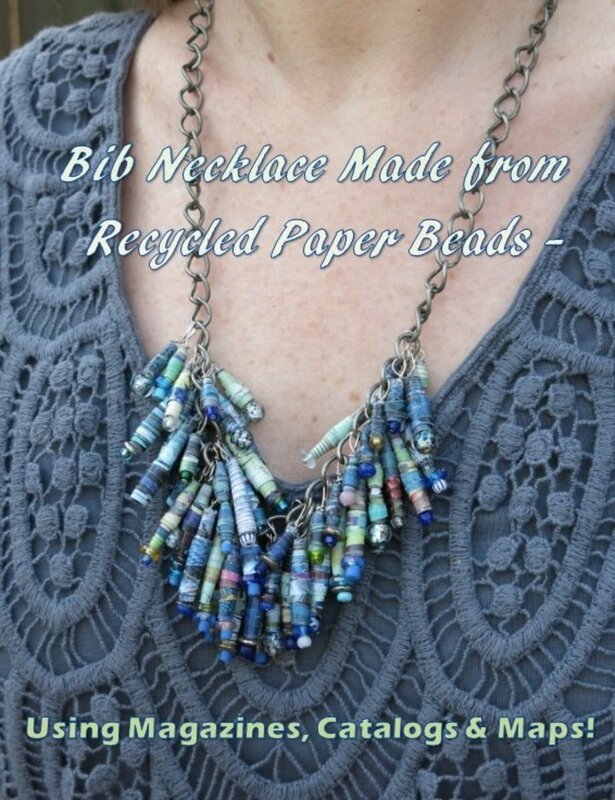 Thanks for sharing your example of this recycled product and jewelry how-to. Pinned to my Arts and Crafts: Jewelry… board. Purl3agony, this is a beautiful necklace. I can't believe it is made of old magazine pictures. It looks like a fun project the whole family can enjoy. Thanks for another great hub! Your necklace is gorgeous! It looks like a million bucks. 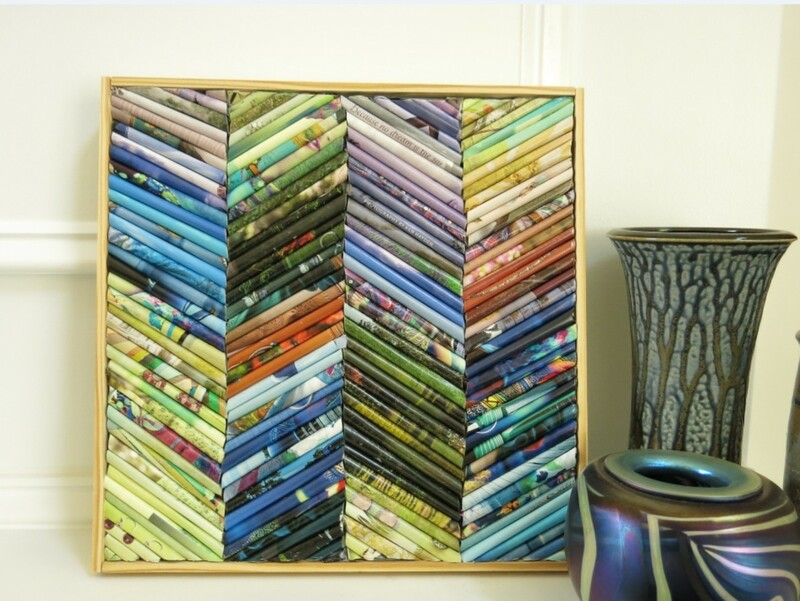 I would have never guessed it was made from up-cycled magazine pages. I love the colors and the necklace goes great with your blue shirt. This tutorial is perfect and easy to understand. Thanks for sharing.